Are Universities Contributing to a Growing Tide of Populism? Universities are key spaces for furthering civic debate and have a responsibility in how conversations of public importance are conducted and framed. So when informed debate fails, have universities failed too? One headline event after another suggests a society divided and dislocated; the UK’s surprise exit from the EU, the rise of the far right across Europe and the bitterly fought US election between Hillary Clinton and President Donald Trump. Given the rise of populism across western democracies, which now seem deeply riven with social and political conflict, it is perhaps fair to ask whether universities have been to one too many of their own dinner parties? At a time when the very future of liberal democracy appears to be threatened by rising inequality and the millions of vulnerable citizens the system has left behind, have universities been complicit, becoming an elitist, corporatised and branded club not serving their communities? Demographic and technological changes are producing winners and losers, and political and social systems are showing the strain. In this moment, many cannot help but wonder whether free trade and free movement are under threat. Universities must bear some responsibility. They have long played an important part in shaping how the world is understood, not least through their teaching and research but also in envisaging solutions. At the University of Melbourne these issues were explored in a recent panel discussion with former US Ambassador and current Chair of the Fulbright Board Jeffrey Bleich, University of Manchester Professor of Migration and Postcolonial Studies Uma Kothari and University of Melbourne Vice-Chancellor Glyn Davis. A LABOUR MARKET FOR WHOM? Universities have become critical to modern economies through mass education and doing the lion’s share of global research that has helped shape the contemporary world. In Australia alone there are over 1.4 million students enrolled in higher education, and over 36 per cent of Australian 25-34 year olds now hold a bachelor degree. In 1971 it was just 2 per cent. The pattern of a growing proportion of citizens acquiring a higher education degree has been repeated the world over. The OECD predicts that by 2025 over 40 per cent of the adult population in member countries will hold a tertiary qualification. A more educated population can generate prosperity for whole communities. Yet, as we have become increasingly well educated, inequality has grown. Leaving behind whole groups of people diminishes the political and social gains over the last half century, and education and technology have been key factors. Changes to work and labour markets in wealthy countries mean jobs not requiring a university or college education are gone for many people – and they are not returning. Technology has long been predicted to disrupt working lives but as inequality grows and many lose out, its wide-reaching affects become all too clear for whole communities. Some estimates forecast that technological change in the next 10 to 15 years will make almost 40 per cent of jobs in Australia redundant, including many highly skilled roles. Research examining 702 occupations found 47 per cent of workers in America had jobs at high risk of being replaced by technology. Universities have played a leading role in the discovery and development of the new technologies that are now set to cause so much social change. Many will fairly say that universities have a responsibility in helping bridge the emerging divide between those with a university education and those without. Are universities doing enough to prepare people for future jobs? During the panel discussion Ambassador Bleich said universities need to change the way they prepare students to adapt them to a radically changing economy. “This notion that you have your four year (degree) and it prepares you for a 30-year career and then you retire doesn’t make sense anymore,” he said. “So people will start looking to institutions to train them differently for a different purpose for a shorter period of time, but almost like a subscription service, (they will need to) be able to keep renewing their education over a longer time,” he said. During the Industrial Revolution in Britain, textile workers, most famously the Luddites, argued steam engines and others machines would destroy their employment. The reaction to changing technology this time around might be more wide ranging than the nineteenth century, as other divisions run deep between the winners and losers from the liberal order. Education has become a fundamental divide in democracy. Education was prophetic in the voting patterns in both the recent US election and Brexit vote. The best single predictor of support for Donald Trump in the Republican primary was the absence of a college degree. Voters with postgraduate qualifications split 75 to 25 in favour of ‘remain’ in Brexit, meanwhile, among those who left school without any qualifications, the vote was almost exactly reversed: 73 to 27 for ‘leave’. But the problems go deeper. Over the last 30 years the belief in the importance of a democratically elected government has diminished. Here too universities must share some of the blame. Never has the world been so educated yet much of the debate is at odds with the evidence. Universities have long been important for providing evidence to inform debate even when they are not directly involved. Universities need to do more to educate and lead. Professor Kothari told the audience that universities had a key role as global institutions in countering the “fear of otherness” that she said was a catalyst in both the Brexit vote in the UK and the election of Donald Trump in the US. Luckily, adaptation is a great skill of the academy, which has reinvented itself and its missions since its origins a millennium ago. Universities are rethinking educational models and missions. The trick will be to ensure they do this in time to meet pressing problems for which they have contributed. Dr Gwilym Croucher is a 2017-18 Fulbright Scholar. While based at the Goldman School of Public Policy at the University of California, Berkeley, Dr Croucher will engage policy makers and university leaders, to develop new options for system design, university strategy and government policy to help provide greater surety for research systems in California and Australia, and the outcomes they facilitate. Originally published on Pursuit. Read the article here. 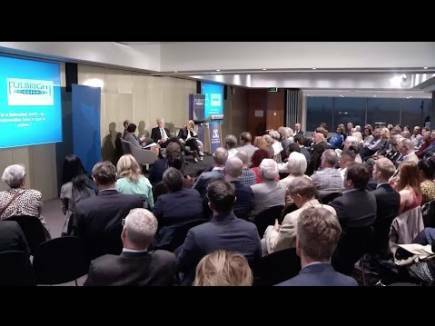 Watch the recording: In a dislocated world – do universities have a case to answer?